Palm Beach Cycle Chic: A New Cycle Chic Family! A New Cycle Chic Family! This evening I had a very pleasant surprise when I came out of the Publix foodstore to my bike. Lo and behold another dutch-style bicycle was parked at an adjacent pole where a purple mountainbike had been when I arrived 20 minutes prior. Turns out it was a family outing (as well as a beer run as evidenced by the brilliantly strapping a case of Sierra Nevada to the rack). We were all sheepishly glancing at each other and after mutually striking up conversation, turns out he had been in China and imported the bicycle here. The bicycle is an old-fashioned Phoenix, much like the Flying Pigeons, and apparently are getting harder to come by over there since electric bikes are the fashion now. It's a beautiful pristine bicycle with full chainguard, traditional rear stand that lifts the rear wheel up, and beautiful shiny rod brakes. He also had the white cotton tail painting on the rear fender and the double top bar so it's built for heavy utility hauling. His wife told me that because the bike doesn't have a skirtguard like mine does, her skirt once got caught up in it and she had to cut it off with scissors! Lucky it didn't cause an accident. So these features are indeed truly useful, they are not just decoration. She rides a beautiful beach cruiser and the son has his own stylish cruiser bike with white walls and red rims. They rode over from the historic El Cid neighborhood a mile or so south down the road. It's very wonderful that this area is at the very least family friendly for bicycling. The best part I noticed is that they weren't wearing helmets and thus not riding with fear. Way to go guys! 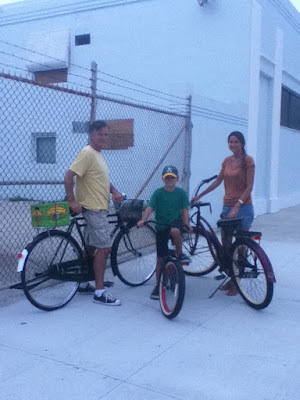 A beautiful chic family on beautiful chic bicycles, Welcome to Cycle Chic! Did your bike come with a skirt guard or did you make one by yourself? I am glad your incident ended without serious injury! I used to have a cheap beach cruiser single speed in college that came with just about nothing except fenders. The chainguard covered the top only so I always ruined pants on the chain. Because it did not have a rear rack, I had a basket in the front that liked to come apart and hit my front tire, once sending its contents and me flying off in the middle of the courtyard at school on my birthday. My laptop went flying and has a nice dent in the corner as a battle scar. Luckily though everything survived. I've hated front baskets ever since. And yes mine came with the skirt guard. I think oilcloth or something. It's super durable and since its cloth, it doesnt rattle. It's also really securely tied. I think all Gazelle dutch bikes come with them. My boyfriend has problems sometimes on his bike because the guard is metal and sometimes comes off and hits the rear wheel. I know the guards are really hard to come by here so one would have to order from Europe. Basil has some cute cloth ones. It was two miles to school on quiet dirt roads on the countryside, not much of traffic to worry about either. aw that sounds like such a nice memory :) Other than the shoelace strangulation.